Marinate the minced beef in a bowl with the soya Sauce, the sugar, some black pepper powder, the chicken broth and some salt for 10 minutes. Heat the water in a pot until boiling and add some salt and a bit of Alce Nero olive oil. Once boiling, add the penne and follow package instructions timing: 7 minutes. If you like the pasta softer, not al dente, you can add one or two minutes. Now drain them well and set aside. Wash the tomatoes and cut them into large pieces. Peel the onion and dice it. Heat the wok and sauté the chopped garlic, the onion and the minced beef. Add in the tomato, the baked beans and the water. Let it cook for 10 minutes until the sauce is thickened. Pre-heat the oven at 180oC. 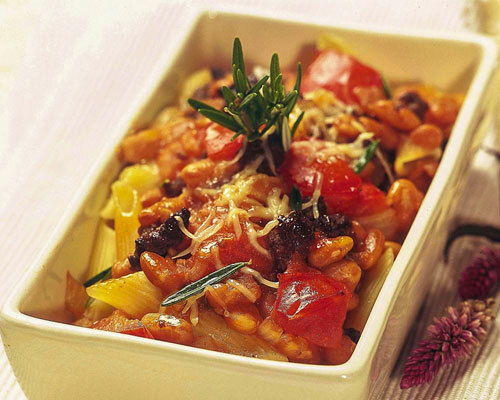 Place the penne into the long shaped ramekin and pour in the baked beans and minced beef sauce. Bake for 15 minutes. Take it out from oven, sprinkle with parmesan if you like a cheesy touch. Comments: Enjoy this high protein recipe made with beef and baked beans which give you energy punch with B complex vitamins. One serve of this recipe gives about 34% daily value of iron, an essential mineral and an important component of proteins involved in oxygen transport and metabolism. The dietary fiber from baked beans is an important inclusion in our diet as it is essential to prevent cancer, control blood cholesterol & promotes bowel health. This recipe is also high in zinc, an important mineral that boosts immunity, controls blood sugar levels, improves stress levels & aids wound healing. The sodium level in the recipe can be slashed by reducing the amount of soy sauce used for marination.